Streets in Rio de Janeiro, Brazil, have been filled with masonry and cars have been covered with debris after two buildings – one nearly 20 storeys high – have collapsed in the city. According to officials, up to 11 people are believed to be inside the buildings and five people have been rescued. The cause of the collapse remains unclear, but witnesses spoke of an explosion and a strong smell of gas. City Mayor Eduardo Paes said that they were focusing on rescue efforts before looking into the incident’s cause. 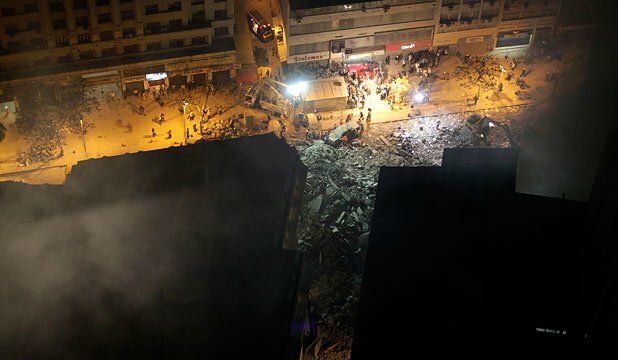 Rescue workers were able to pull a cleaner from inside one of the elevators in the rubble after he managed to call a friend on his mobile phone. The buildings – located near the Municipal Theatre and the headquarters of oil giant Petrobras – crushed a four-storey construction site on their way down. The area surrounding the buildings is now covered in rubble, with several cars partially covered by debris. Dozens of emergency workers are at the scene and police have cordoned off the area. Electricity to the street has been cut off for safety reasons. The incident comes a little over three months after a suspected gas explosion at a restaurant in the city left three people dead. Concerns have been raised about the state of Rio de Janeiro’s infrastructure as Brazil prepares to host football’s World Cup in 2014 and the Olympic Games two years later.